That’s probably the most common question I get when I talk to someone who eats a “normal” diet. They are mostly referring to what you have with the fish, meat, poultry or other source of protein on your plate. 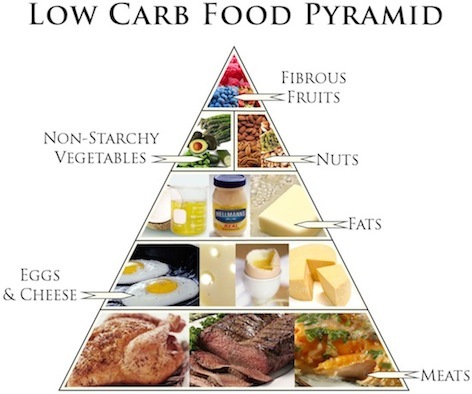 It seems to be the biggest challenge for most of us when trying to low carb. What do I have instead? How can I survive without the pasta, bread, potatoes/tubers, rice, quinoa and cous-cous that I usually eat? Won’t my food become super boring? No worries, here are a couple of ideas for you, to start with! Cauliflower mash instead of potato mash. You do it pretty much the same way as you would a potato mash. Boil the cauliflowers until soft, pour out most of the water. Mash them with an immersion blender, add butter, cream and seasonings to your taste. I like to fry finely cut bacon in butter and add that too the cauliflower and then mash it all together, sometimes with additional butter and some cream. It’s delicious! Once you’ve had it, you can’t stop! Zucchini pasta instead of the normal pasta. Take zucchini, slice it thin, most easily done with a cheese slicer, and boil it for a couple of minutes. Add your favorite pasta sauce, enjoy! Cauliflower rice instead of white rice. Take a cauliflower head, grate it coarsely so you get pieces the size of rice. Boil it in water with a bit of salt for about 3-5 min. Pour out the water, enjoy with sauce, meat, chicken or whatever you usually have with rice. Forget all about the rice, pasta, potatoes and other carby stuff. Make a giant salad with leafy greens, cucumber, bell pepper, feta cheese/other cheese you like, sunflower seeds/pumpkin seeds/nuts, olives, ham/fried bacon and pour lot’s of olive oil on top. You can just steam cauliflower and broccoli, let grass fed butter melt on top and savor it! Make stuffed bell peppers in the oven. Fill them with cheese of your choice, some onion and mushroom and enjoy! Wrap asparagus in bacon and fry in grass fed butter or coconut oil. Yummy!!! Please share your discoveries as you try out this awesome way of living! As you can predict from the name you cut out most of the food containing carbohydrates exchange the energy source to fat instead. What does that mean in real life then? Vegetables growing over ground, like broccoli, kale, salad, asparagus. Alcohol, especially beer and other malt or sugar containing drinks. Dairy products, they contain a lot of milk sugar, lactate. Be sure to use the ones with a high fat content. Sugar in all ways, that includes honey and agave sugars. Starch rich foods. That is pretty much everything growing under ground, like potatoes and carrots, and also pasta, bread and rice. Fruits in any bigger amounts. The good thing is that you should eat until your feeling full, no hunger required. You’ll still loose weight, if that’s your goal. If you already have your ideal weight, you don’t have to worry, you’ll keep it, with some minor changes in you body composition probably. As long as you keep your insulin levels down, by keeping your blood glucose levels down you’ll be getting all the health benefits from this way of living. Breakfast: Bacon and scrambled eggs with cheese. Lunch: Salad with feta cheese, olives, sun-dried tomatoes, egg, tuna and olive oil. Dinner: Minced meat burgers, with cheese topping and mayonnaise, served with all the usual burger toppings but no bread. Snacks (if needed): A handful of peanuts or other nuts. A hard boiled egg with mayonnaise. A handful of chopped sausage and cheese. There’ll be more recipes and menu suggestions coming up!